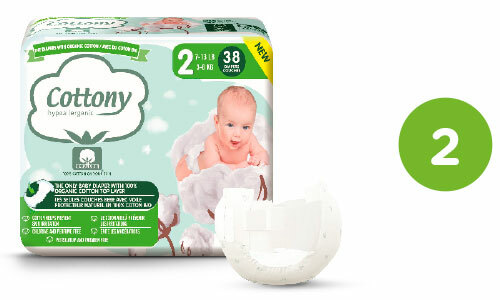 For your little one’s delicate skin, discover the absorbency of Cottony. The only diaper with 100% organic cotton next to the skin. The only diapers made with 100% organic cotton on the skin. The cotton helps prevent irritations. Chlorine and fragrance free. Very soft and absorbent. Hypollergenic. Ideal for sensitive skin. Dermatologically tested. 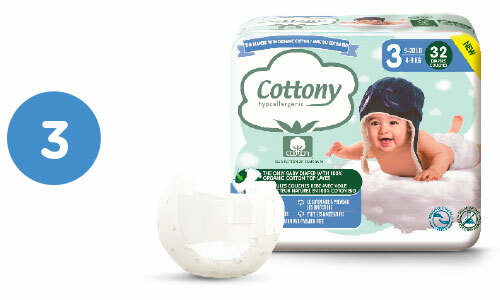 The innovative diaper made from hypoallergenic organic cotton with TCF (totally chlorine free) cellulose fluff.